According to the International Futures Assessment Model, China and the United States are the two most powerful countries in the world. The United States may currently dominate in military power, quality of life, and per capita income, but the Chinese economy has been growing at a breakneck pace, with an average annual GDP growth of about 10 percent and a burgeoning population in the billions. As such, China and the US are simultaneously competing and cooperating, sharing and hoarding, opened and guarded. This unique state of affairs inevitably leads to the populations of each country having equally unique attitudes, perceptions, feelings, and thoughts towards their counterparts. Using an ethnographic approach, including fieldwork techniques such as observations, interviews, and immersion, this ethnography will explore the Chinese perceptions of and attitudes towards American people and the United States as a whole. As this is a work based on the principles of ethnography it seeks to identify general patterns within Chinese society. It is inductive in that I undertook this project without a hypothesis or theory in mind that I wanted to test. Rather, I immersed myself in the culture and society of China and observed patterns and phenomena, which I then analyzed to create fairly accurate generalizations and credible theories. In a nebulous and dynamic field such as ethnography no theories could possibly represent all people in the group being observed, and they do not claim to. Instead, theories derived from ethnographies are tentative generalizations, albeit generalizations derived from credible observations and much research. As previously stated I used anthropological fieldwork techniques as the basis for my research. 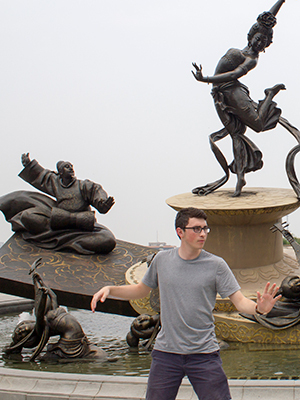 I immersed myself in Chinese culture everywhere I traveled, constantly trying to do things the Chinese way so as to better become a part of Chinese society. This is the key to gaining keen insight into what Chinese people truly think. I relied heavily on observation in my first weeks in China. I watched how Chinese people treated Americans, what they said to us, and tried to notice patterns in their behavior. Once I had made enough observations I used what I had seen to frame questions that would yield the most insightful and meaningful answers. I wanted to do so much observation before coming up with research questions because according to the ethnographic method one must be free of bias when studying a culture. I wanted to avoid framing questions around what I, as an American, thought to ask, and instead, ask about what I, as a person amidst Chinese culture, felt was significant. When I moved to the interview phase I did not always follow a script. I wanted to let conversation flow naturally because only then would the truth come out. I never started a conversation with my most revealing questions; rather, I made small talk and slowly peeled away the layers of obscurity until the truth revealed itself naturally. My method led to me having many quick and casual interviews and several extended conversations throughout the course of the last month in Beijing. Given that I came to China to understand people’s perceptions and feelings my research has yielded fairly complex results. Chinese people both admire the United States and resent it, fear it and embrace it, emulate it and avoid it, but from what I have observed I have come to the conclusion that there is generally a more positive sentiment towards the United States, or at least the Chinese perception of the United States. Everywhere you go in China whether it is a small town or a vast city you see English writing on signs, clothing, stores, food, et cetera. Even in less populated areas you can’t go five steps without seeing an advertisement with a Westerner on it or a moped painted like the American flag. Nearly every time the group of Americans I was with traveled in public people would stop and stare, take pictures, or otherwise acknowledge our presence to a greater extent that they did for other Chinese people. My research has indicated that, in general, Chinese people tend view United States as very prestigious, perhaps the most prestigious country in the world. Due to socioeconomic, cultural, and ideological factors they, especially young people, tend to regard it positively, with awe and curiosity. Their generally positive feelings frame their attitude towards Americans and lead them to treat Americans in the specific and unique way that they do. In every interview I conducted I noticed reoccurring themes and ideas regarding the US and China. One common topic was that of prestige. A female in her early twenties and a male in his late twenties both specifically used the word prestige to describe America’s status in the eyes of Chinese people. The female, who had traveled to the US before, said, “Chinese people often want to travel to America” because “there is prestige in going to America.” I asked her why and replied that it was because Chinese people perceive the US as being very “developed.” It appears as though to Chinese people development is an indicator of status. The more developed a country is the more prestige is associated with it. This thought process makes logical sense when one considers the changes that have been occurring in China since Deng Xiaoping began the economic reforms. He declared that “to get rich is glorious” and since then the leaders of China have been pushing an agenda focused on development and economic growth. It is reasonable to assume that as young people in their twenties they would have grown up hearing government messages hailing economic development as incredibly important. Logically, if one perceived economic development as good then they would look upon countries that are already economically developed with reverence and respect. This may explain why it appears that the US is thought of as prestigious and why Chinese people seek to travel there. The male in his late twenties that I interviewed expressed a desire to travel to the US. He cited the same reason the aforementioned female did when I asked him why he and other Chinese people want to go to America. He compared India now to China in the 1990s, saying that he did not like India when he traveled there because it was “not developed.” Again this seems to indicate that 21st century Chinese people place a lot of prestige on economic development. Therefore, if Chinese people perceive the US as economically developed (which it is, with the worlds largest economy) then they would look upon it favorably and assign prestige to traveling there. With the two young people I interviewed I felt a sense that they favored individualism (个人主义) more than the previous generations in China. The female I interviewed said that “a mix” of individualism and collectivism (集体主义) is “best.” Her statement was far different than what one would expect to hear from someone born in the collectivist days of Mao. This movement away from collectivism and towards individualism is likely partially responsible for the positive perception of the United States among Chinese people. This is because the US is known for it’s staunch adherence to the principles of individualism. Another concept regarding the United States’ perceived prestige is the concept of “面子 (face).” According to the young female I interviewed Chinese people are very concerned with “爱面子” which has several meanings but she explained that she was referring to it in the sense of “maintaining one’s reputation.” She felt that one reason so many people want to travel to the US (every person I asked the question of said they would like to go to the US) is that it adds to their reputation positively, in other words it gives them face. By going to a developed country like the US they appear more cultured and worldly. This contributes to the sense of wonder and curiosity surrounding the US. In some ways the US has taken on a mythical reputation in Chinese society. I have witnessed this sense manifest itself in many ways during my time in China. As mentioned before, every time I traveled with a group of Americans we attracted attention. Our presence alone was sometimes enough to create a crowd of around 30 people who all wanted pictures with us. We would be given babies to hold and even old ladies wanted to take pictures with us. People would approach us and practice their English or push their children at us and encourage them to say “hello.” It seemed like a good portion of the people that saw us were curious about us. They would ask about the Black people’s hair and want to touch it or they would ask us why we were in China. We look different to begin with but add the fact that we were part of a perceived high-prestige group (Americans) and we became infinitely more interesting. I cannot say for sure, but I seriously doubt that a group of Indian people would be swarmed in the way we are. That being said, Americans are not always interesting simply by virtue of owning an American passport. For example, I conducted a short interview with a middle-aged mother after I had seen her ask for pictures with some of my classmates. I asked her why she did not want pictures with the Korean-American member of our group and she replied that it was because he “looks Chinese.” I then asked her if his appearance “was uninteresting” and she answered in the affirmative. Despite him being an American the woman did not want a picture with him because he did not look foreign or exotic. Because he looked Asian he may as well have been Chinese in her mind. This indicates that there is a certain look that Chinese people perceive as being “American.” It took careful observation of our groups encounters with people in public, but I discovered a pattern in who the Chinese people wanted pictures of. They almost exclusively wanted pictures of the Blonde girls or the Black girls. This is likely because they look the most exotic and classically American to Chinese people. In addition to the high amount of attention Americans get in public, I have observed that a high proportion of advertisements have Western looking people in them. Even companies that are not foreign use Westerners in their advertisements. I attribute this to the theory I mentioned earlier, which is that Americans carry a high amount prestige in China and that because of that Chinese people are very curious about them. If companies use Americans in their advertisements they convey all the things that Americans stand for in the minds of Chinese people, such as cultured, international, wealthy, developed, and interesting. By associating their companies with an American or Western image they are taking advantage of the biases and perceptions of Chinese people regarding those groups. In other words, companies would not use Americans in their advertisements if Americans did not stand for something positive in the minds of at least most Chinese people. The fact that companies often use American looking people in their advertisements reinforces the theory that Americans are perceived in a positive way and with prestige; no one would want to associate their company with something negative. It is not only big companies that take advantage of Americans prestige to get ahead in the business world. On one occasion in 三里屯 (Sanlitun) we were offered free access and drinks at a club simply because we were Americans. I asked why and the man responded that it was because having Americans at the club attracts Chinese people. They assume that if Americans would go to the club that it must be good. Bars and clubs have employees whose entire job is finding Americans to come make the bar or club look appealing. This observation was reinforced when the Korean-American member of our group was free denied entry into a bar in 五道口(wudaokou). He was asked to pay an entrance fee, “the Chinese fee,” because he looked Chinese. It was only after I went back to the door and argued with the bouncer was he allowed in for free. This shows both the privilege Americans enjoy in China and the perceptions of Chinese people as to what a “real” American looks like. Countless times I had to tell people that the Korean-American was, in fact, an Americans. Many times they would laugh as if I was joking and when I asked why they didn’t believe me they said it was because he doesn’t “look” American. It seems that some Chinese people have the impression that very few Americans are not white or black. It is not just the United States’ economic status that creates the sense of prestige and curiosity among Chinese people. American ideologies appear to resonate with some Chinese people, especially young people. The American concept of freedom (自由) and the American Dream (美国梦) were mentioned during my interviews. Unlike some of the other observations this trend was not specific to the younger generations. People I interviewed both young and old surprisingly used very similar phrases to describe America. I asked the question “What are three words you would use to describe the United States?” Two people’s answers included words related to economic development and the word “强势” meaning “strength.” But every single person’s answer included the word “自由” meaning “freedom.” It seems that people of various ages (the oldest woman I interviewed was born in the 1970s) and backgrounds have similar feelings about the US. The idea of freedom was far more prevalent than I expected. The young woman I spoke with said that she felt freer in the US than in China. She said she liked the freedom but felt that the US was “too free” citing that “[Americans] have guns.” She said that that level of freedom was too high because she was “very especially [sic] scared of guns” while in the US. On the other hand, the young male I interview said he liked that Americans can own guns, saying simply “I like guns.” Clearly the opinions on gun ownership are diverse, but the point is that in general Chinese people seem to enjoy the freedom they experience in China as in the cases of the young woman and the older woman or the idea of American freedom as with the young man. Both young people I interviewed made remarks about the “American Dream.” The young woman told me that she thinks American is called “美国” (literally “beautiful country”) because of the “American Dream.” The young man said that he liked America because he thinks the US system “makes people get rich.” The fact that Chinese people know about and appear to like the idea of the American Dream is another indicator that the US is looked upon favorably by Chinese people. They appear to agree with the ideological values of many Americans, which would likely lead to them having a positive view of the US. This is yet another reason Chinese people perceive the US as prestigious. Although my research has indicated that most Chinese people like the United States a survey by the Pew Research Foundation found that in 2012 48 percent of Chinese people have an unfavorable view of the US and 43 percent had a favorable view. However, three years later those opinions may have changed. This is not unlikely because in 2010 the study found that 58 percent had a favorable view of the US. Clearly the Chinese popular opinion of the United States is dynamic and can change quickly. In addition the results might be affected depending on how the study was conducted. The questions may have related more to America politically as apposed to socially. This ethnography focuses on the social and cultural perceptions that Chinese people have of the US, which may explain why my results don’t reflect the studies. Another reason could be that since I am an American people I interviewed may have given me answers that favor America so as not to upset me. The goal of my research was to characterize and explain the Chinese perception of Americans and the United States. Through observation and interviews I have come to the conclusion that Chinese people generally feel positively towards the United States. They see the United States as prestigious because of its high level of economic development, which translates to a positive image of the US. Many younger people and some older people feel drawn by the United States’ ideological values such as 自由and 美国梦. This also translates to a positive image and would explain why so many Chinese people want to travel to the US. In addition, it seems that traveling to the US or being involved with it in some way (ie. Wearing clothes with English or displaying the US flag) adds to one’s 面子 or personal prestige. These factors combined make the United States very appealing and interesting to Chinese people. The prestige and fascination associated with the United States captures the curiosity of many Chinese people both young and old and elevating it to a near mythical level in Chinese society. “China: Overview.” World Bank. World Bank Group, n.d. Web. 03 Aug. 2015. “How Americans and Chinese View Each Other.” Pew Research Centers Global Attitudes Project RSS. Pew Research Center, 01 Nov. 2012. Web. 04 Aug. 2015. Miles, Kathleen. “You’d Be Surprised What Chinese College Students Think Of America These Days.” The Huffington Post. TheHuffingtonPost.com, n.d. Web. 03 Aug. 2015. “Power Index (percent of Global Total).” IFs Forecast. Google, n.d. Web. 03 Aug. 2015.